About the only upside of being battered by Nor’easters is that sometimes the powerful winter storms dredge up relics of the past. The recent storm which scourged the Northeast also scraped the sand off some long-hidden railroad tracks running along the New Jersey’s coast. The tracks have reappeared every few years since 2014, and every time nature reveals them, locals flock to the beaches to see and photograph them. 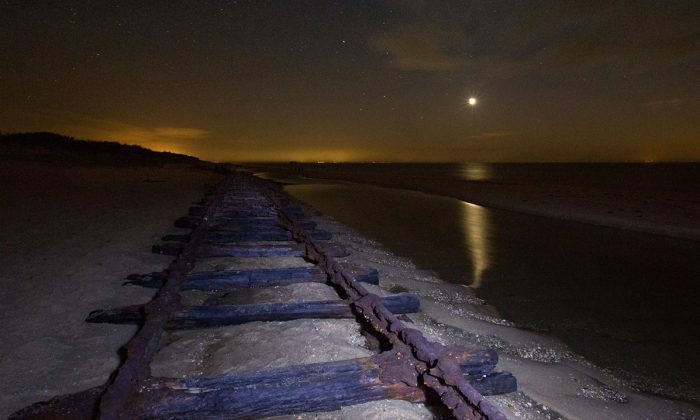 This month, a set of century-old tracks appeared at Higbee Beach, between North Cape May and Cape May Point at the very southern tip of New Jersey’s northern half, on a peninsula projecting into Delaware Bay. “It feels sort of like you came across buried treasure,” Samantha Heely told NJ.com. Heely, 34, is a resident of Lower Township, about two miles north of the beach. Heely told NJ.com that she first saw that tracks last summer and researched their history. The Jersey Shore rail line was built in 1905 and once carried sand from the Cape May Sand Plant, according to the Inquirer. The fine-grained quartz sand was used for glass-making and construction. Eventually the plant closed, the tracks went unmaintained, and the tides and wind buried them. The first time in decades they resurfaced was in 2014. Another storm in late November 2016 brought them back into view. They again were covered by shifting sand until the summer of 2017, when Heely first saw them. Another Nor’easter is predicted for March 13, so the tracks might be gone by the next day—or, even more tracks might emerge.